What Sting thinks about my book "The Missing Element"
And others using the wisdom of the ancients and your natural ability for compassion. The Missing Element was written for all of us who have ever felt that something was “wrong” with us, that we are odd and outside the norm. Drawing on her profound spiritual knowledge and sensitivity, Debra Silverman seeks to help you see beyond your perceived flaws – to find your ‘true’ self, your gifts and your place in this world. Fusing psychology and spirituality, Silverman offers ways to embrace and make peace with ourselves so that we can become more powerful and effective human beings. Her teaching comes from the wisdom of the elders. Using personality types that are based on the four elements, she reveals that whatever pain you experience is specific to your personality and that your issues will repeat themselves again and again until you see yourself and others from the compassionate vantage point that unites all of us. 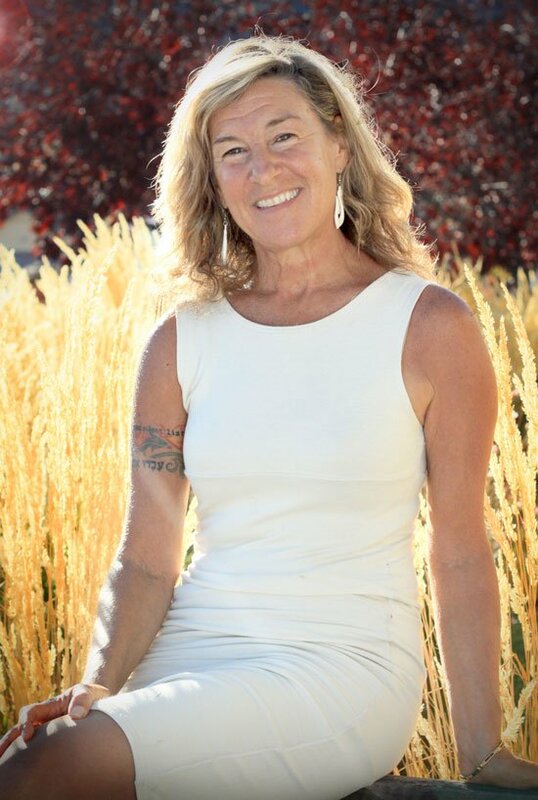 In this excerpt from her book THE MISSING ELEMENT: Inspiring Compassion for the Human Condition, author Debra Silverman explains what she is asking of the reader as they embark on a journey of self-discovery and growth. I want to enroll you as an agent of change – and you’ll need two things. One is to become acquainted with the Four Elements as they exist inside you. The other is to cultivate the Observer’s position so that you can stand back and make change by altering the way you see and live your own story. WATER: For nine months we surrendered to • the awesome feminine power of a womb filled with fluid. Herein lies the wisdom of silence and trust. AIR: Air is everywhere – the universal source of breath and language. No one can live without breathing or communicating. Herein lies the wisdom of wonder and consciousness. EARTH: The patience of a mountain, the generosity of a tree. Earth is the immovable rock, tirelessly waiting for our respect. Will we care for her? If we don’t, don’t worry: she will survive. We may not. Herein lies the wisdom of respect and balance. FIRE: The heat of your heart and the fire of the sun drive your destiny each day. We cannot live without either. Herein lies the wisdom of accepting your mission with full conviction. Modern life is stalking us to change. With so many books being written about it spirituality has never been as popular and commonplace. As individuals and as a species we are growing. It’s an unfortunate truth that we learn the most through mistakes. It is easy to judge humanity, our neighbors, our human nature, and our own idiosyncrasies. We have danced with evil, played with guns, tried to control and scare the Feminine into submission, and nearly destroyed the Earth. Evolution occurs by learning through our mistakes, and we have a long history of making mistakes: nuclear bombs, the holocaust, 9/11, countless wars, to mention only a few examples. Can we forgive human nature, the species, and its long path down evolution lane? Would I love to change the way we learn our lessons? You bet I would. Would I love to assist people to learn the easy way? Sure. As a parent I want to offer a positive future to my kids. My work is meant to share what I have found that holds wisdom and hope. What I’m calling the Missing Element is twofold: 1) it is the Observer inside you – the part of you that can stand outside of judgment and see yourself with a more wise and compassionate approach – much like our elders did. And 2) the Missing Element also refers to the Elements that make up your personality and more specifically, the element, which is your weakest. Allow me to help you to see through the eyes of love. All is well, and we are exactly where the prophets of old predicted we would be – that we would reach a time when we had to get on our knees and return to basics. Water is wet, fire is hot, earth is heavy, and air is everywhere. The Good News: You have the personal power to make a difference. The power to create change resides inside you. It’s so much simpler than you know. And it starts with you. 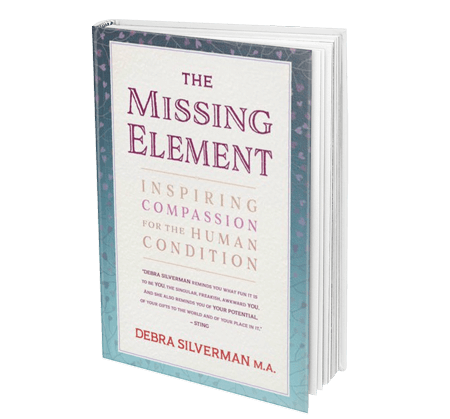 In this excerpt from her book, THE MISSING ELEMENT: Inspiring Compassion For The Human Condition, author Debra Silverman explains what the Missing Element is and what the read can expect to learn about themselves and how they can make a difference in the world. I am writing about you. You; wonderfully flawed, perfectly nutty, beautiful, broken- hearted, powerful you. Would you like to impact the planet and be a part of a positive change? Would you like to feel more at peace with yourself and be a happier human being? Here’s the good news; global change begins at home. Yes, recycling and saving water is very important, but your big job is to open your eyes to who you truly are – warts and all – and to make peace with that clunky, wonderful person inside of you. If you can do this, then all the negativity, fear and shame that block your authentic expression will begin to lift and you can become a more powerful, effective human being on this planet. That’s how we begin to change the world. We heal one person at a time, and we start with ourselves. I’ve looked at the younger generation – I feel for them, this particular generation is suffering in a way I cannot relate. College graduates are expected to go out into the world and be successful, loyal, reliable, kind, knowledgeable, respectful, on time, fit, beautiful, and rich. We expect you to get married, pay taxes, buy a house, go to church, never have a sexual thought about anyone but your partner, and raise perfect children. Good luck with that. What they ought to say to us is: Be prepared. You will fail, you will break down at some point and become overweight, addicted, and aged. Your children are going to do drugs and hurt you; some tragedy might befall them. Your parents may never understand you or even want to understand you, and you will doubt yourself every step of the way. These are the insights I have gathered from watching human nature for more than three decades, right up close and personal. I have studied you, and I am going to speak to the obvious. We all started off determined to love our mother, father and siblings. We accepted our childhood upbringing as “normal.” It didn’t matter what the story line was – how crazy or straight it was – we all had to eat, sleep, go to school, look for love, and hope that someone cared. We were forced, by circumstance, to accept our parents’ reality – until we were able to leave their homes and begin our journeys as individuals. No matter where we went, we carried the imprint of our childhood. One of the purposes of my work is to help you understand those early stories, and to ask yourself, “What is the nature of my unique personality? What am I supposed to be learning as a result of my life story? Do I have patterns that repeat themselves over and over? Do I tend to be brokenhearted? Am I always short on cash? Do I often feel unappreciated?” No matter how many spiritual books you read, crystals you hold, or green protein powder you drink, you cannot be freed of your story without identifying your broken record, and becoming conscious of how it limits or supports you. You are who you are – it’s not about changing your own nature – it is about rewriting the story, embracing your shadow with compassion, so that you can bless this life and live in gratitude, as a kind, loving being. I can confidently tell you this: wherever your greatest pain lives – whatever story that follows you around like a boring friend that you just can’t get rid of – therein lies the rocket fuel to get you to your purpose and wisdom. Your pain and your purpose are one and the same. A body of wisdom exists that is based on many ancient cultures. American Indians prayed to the Four Directions. Kabalistic Jews spoke of the Four Worlds. The Hawaiian Hula culture immersed itself in the Four Elements. Buddhists wrote the Four Noble Truths. And the Egyptians passed onto us their version of the Four Elements, which is steeped in astrology – the oldest science on earth. These people honored the land they lived on – not because it was a good idea, but because they were dependent on it for their survival and they had to pay attention. They operated with rocks in their pockets and wisdom in their hearts. These cultures cultivated a long view of seeing the world, and used a distant “Observer” position to avoid becoming mired in the myopic vantage point we call ego. The elders of the American Indian and Chinese cultures looked seven generations ahead as they made their decisions. We have neglected such wisdom, living more from what will make us happy today, rather than what will bring peace to our great-great-grandchildren and their grandchildren. Sad but true, we all grow out of the soil of pain…The crises that arise in our lives are here to serve us, not to hurt us. As counterintuitive as it sounds, crisis is nothing more than your own soul trying to get your attention, to show you your path. The soul uses pain, crisis, and trauma to wake us up. Who made that up? Water is wet, fire is hot, the mango pit is too big, and your childhood was designed to introduce you to pain, death, abandonment, abuse, and heartbreak right at the start. Life doesn’t care how hard your lessons are, or if you can handle them. Life just wants you to learn and to grow, and to keep your heart wide open. You are being stalked through this life to learn lessons and to pay attention to life’s teachings whether you know it or not, whether you like it or not, whether you get it or not. What kind of karma are you carrying? Good karma, bad karma – too bad no one knows what that means. Hard Truth: from birth onward you carry an invisible suitcase filled with story lines and dramas packed without your conscious remembrance. You take your first breath, then you’re slapped on the bottom, and you are front stage center – a member of the human race. Rushing toward awakening or snoring right through it – it’s a choice. This is life. A breath, some karma, a body, and a big juicy story. Period. Full stop. You arrive and then here comes the wound. Therapists make millions of dollars delving into your story’s details. They help you to discover why you’re suffering, and they listen attentively, looking for whom to blame, and how you came to believe your version of the tale. They help you to find solutions to make you feel better, then they happily suggest that you come back next week to deal with the next round. Don’t get me wrong, it’s important to tell our stories and describe the wound – but with what intention? The centerpiece of my psychological practice, and of other therapists who are worth their weight is: How can I help you to turn your well-worn stories into a gift and a lesson? I’ve looked at the younger generation – I feel for them, this particular generation is suffering. College graduates are expected to go out into the world and be successful, loyal, reliable, kind, knowledgeable, respectful, on time, fit, beautiful, and rich. We expect you to get married, pay taxes, buy a house, go to church, never have a sexual thought about anyone but your partner, and raise perfect children. Good luck with that. These are the insights I have gathered from watching human nature right up close and personal for more than three decades. I have studied you, and I am going to speak to the obvious. We all started off determined to love our mother, father, and siblings. We accepted our childhood upbringing as “normal.” It didn’t matter what the story line was – how crazy or straight it was – we all had to eat, sleep, go to school, look for love, and hope that someone cared. We were forced, by circumstance, to accept our parents’ reality – until we were able to leave their homes and begin our journeys as individuals. No matter where we went, we carried the imprint of our childhood. One of the purposes of my work is to help you understand those early stories, and to ask yourself, “What is the nature of my unique personality? What am I supposed to be learning as a result of my life story? Do I have patterns that repeat themselves over and over? Do I tend to be broken-hearted? Am I always short on cash? Do I often feel unappreciated?” No matter how many spiritual books you read, crystals you hold, or green protein powder you drink, you cannot be freed of your story without identifying your broken record and becoming conscious of how it limits or supports you. You are who you are – it’s not about changing your own nature, it is about rewriting the story, embracing your shadow with compassion, so that you can bless this life and live in gratitude, as a kind, loving being. Personally, I consider that thinking of pain as the doorway to wisdom is a horrible idea because we’re all going to resist it. No one willingly walks into hard lessons. Most of us deny, avoid, and drive as far away from pain as we can. But it doesn’t matter. Pain is our primary access point for learning the important lessons. Period. Take a moment to reflect and it’s not hard to see. Every time you’ve experienced real pain you have entered a phase of growth. Did you learn the lesson and change your ways, or are you repeating your story over and over again? Don’t fear – your repetitive story has been perfectly designed just for you. Consider the example of the Dalai Lama. If you look at his life you will see how he was set up to learn (and then to teach us) about letting go. He was recognized as the Dalai Lama at the age of three, and had to leave his parents’ home. This is what happens with Rinpoches – they are taken away from their families and trained as leaders. The Royal Highness began his lifelong practice of “letting go” as a toddler. As an adult, he had to let go once more when the Chinese mandated that he and his monks were no longer welcome in Tibet. They were forced to leave their temple, never to return again.